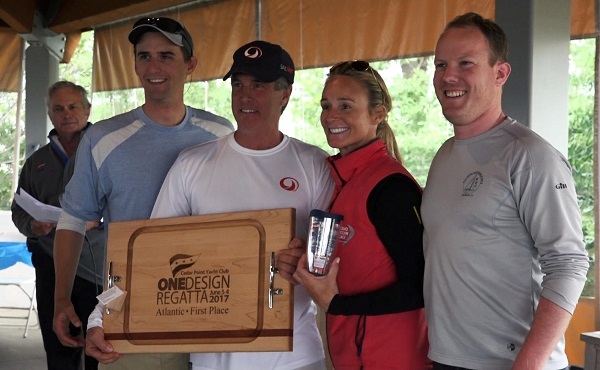 More than 400 sailors from throughout the United States and abroad competed in the 2017 OneDesign Regatta at Cedar Point Yacht Club on June 2-4. Six classes (Atlantic, J109, J105, J88, Beneteau First 36.7 and J70) and 67 boats raced throughout the weekend in two circle courses. On Saturday, sailors worked through a squall, keeping the pace brisk and putting talents to the test. On Sunday the breezes were lighter, and some of Saturday’s leaders held on to win while others saw the leads change through as many as seven races overall. Atlantics: Scott Reichhelm of Westport was the winner, skippering “Shucks,” and coming in first in three of the class’s four races. Mark Foster of Southport came in second, and Jim Doyle of Easton was third. Ron Marsilio, also of Westport, came in fourth. J109s (East Coast Championship): David Rosow of Southport finished first among 17 J109s competing in six races, in “Loki,” followed by Jonathan Rechtschaffer of Montclair, N.J. and Carl Olsson of New Rochelle. J105s: Bruce Stone of San Francisco, in “Good Trade,” finished first in four of seven races to win the class, besting runners up George and Alex Wilbanks of Westport. David Willis of Huntington, NY, came in third. J88s: Elizabeth Barry of Stamford, in “Escape,” came in first on the strength of three straight wins in six races, narrowly beating runner up Iris Vogel of New Rochelle and Douglas McKeige of Mamaroneck, NY. Beneteau First 36.7: William Purdy of New York City, in “Whirlwind,” won in the largest boats competing in the regatta, followed by Lou Melillo of Middletown, NJ and Alistair Duke of Wilton. J70s (Long Island Sound Championship): Doug Clark in “Polar,” from Mystic, CT, won a narrow victory, finishing first in three of six races and fifth in the other three. He defeated runners up Andrew and Melissa Fisher, of Greenwich, and third-place finisher Team Victura of Westport. Corinthian Honors: CPYC encourages amateur sailors and gives a special Corinthian Team honor to those who race non-professionally. Eleven of the 19 J70 teams qualified as Corinthian, and the winners were CPYC member Trevor Roach, of Darien, followed by Louis Donahue from Canada, and Carrie and Ed Austin of Ridgewood, NJ. The 2017 regatta was presented by North Sails, Title Sponsor, as well as these sponsors: Fairfield County Bank, Stew Leonard’s, Coral Reef Sailing Apparel, Landfall Navigation, Gill Marine, Black Rock Yacht & Athletic Club, Rex & Cove Marine, Sailors for the Sea, and T2PTV, which provided video of the regatta. Sailors for the Sea attended to help CPYC run a “clean regatta.” Clean Regattas is a certification system that enables sailors to protect local waters with 25 Best Practices that make sustainability approachable and easy.